Blendec Home offers you The TB 621 20, The Professional’s Choice 1560-Watt Total Blender which promises to deliver a performance equivalent to using nine other kitchen appliances. It has a very simple design making it a very easy to use countertop appliance. With its simplicity comes the convenience that it brings to your kitchen not just in setting it up but also in cleaning it as well. It provides an all-in-one function in making smoothies, juice, ice cream, sauces, and has many other applications in blending, chopping and making purees. 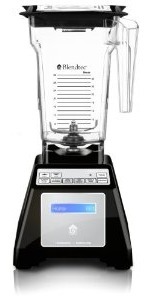 This blender also features the popular trademark of Smart-Touch technology in food processing appliances. The power button from a digital touchpad and the unit’s cycle functions automatically in speeding up and slowing down the mixing of ingredients using the two-prong stainless-steel blades, which spin at up to 29,000 rpm, just enough to extract the right amount of flavor from everything you blend. It also turns off automatically after the cycle is completed. There are six blending presets, with speed up and speed down and pulse. The square, polycarbonate jar has a capacity of around sixty four ounces and also has a large handle, measurement labels, and a fitting lid. The jar comes with a one year warranty while the motor base has a three year warranty. A lifetime warranty is granted on the coupling and blade. These offers are quite tempting when thinking about purchasing this appliance as it demonstrates very clearly Blendtec’s confidence in the quality of this product. 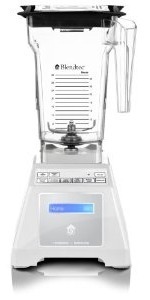 The Professional’s Choice 1560-Watt Total Blender can grind practically any ingredient you have in your kitchen. It can finish your creamy smoothies, creating a perfectly smooth blend without any traces of bits or seeds. You are sure to enjoy a healthier eating and drinking with the huge variety of fresh fruits and vegetables, seeds, nuts and pulses that you can blend in it. This is a superb piece of kitchen equipment for anyone who does a lot of food preparation or who wants to prepare blended drinks, soups and smoothies on a regular basis. The entire package includes a sixty four ounce jar with lid, base with a 1,500 watt three HP motor, patented two prong stainless-steel blades, and a recipe book with more than a hundred recipes. The Professional’s Choice 1560-Watt Total Blender is available in a choice of either black or white which looks sleek and stylish in almost any kitchen setting.